Hobbs Patricia Fine Suede Black Ankle Boots. Various Sizes. RRP £169. Timberland Women's Amherst Canvas Chukkadark Denim Chukka Boots Dark Denim . Find the perfect pair of size 6 women's boots to complement your look. 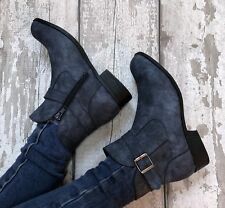 From stylish over the knee boots, casual ankle boots to comfortable walking boots, you're sure to find a pair to suit your style here on eBay. Dress up any outfit with size 6 over the knee boots, perfect for wearing during the day through to the evening. Choose a pair of flat over the knee boots and pair with jeans for a stylish everyday look, or opt for a pair of heeled leather over the knee boots for a glamorous evening look. A wardrobe staple, size 6 ankle boots will keep you looking stylish all year round. From chic biker boots to classic Chelsea boots, you can find ankle boots in a range of colours, materials and designs to suit your look. Team ankle boots with a leather jacket for effortless style or wear them in the summer with a cute skater dress. Step out in style in a pair of size 6 heeled boots, an easy way to finish off any look. From chunky platform boots, to skinny stiletto-heeled boots, to boots with a wedge heel, choose from a variety of styles and colours. Support your feet when you're on the go in women's size 6 walking boots. You can find a range of different walking boots from lightweight styles to heavy duty walking boots, available in a selection of colours and designs. Choose from your favourite outdoor brands including Karrimor, Timberland and Merrell and find a pair of walking boots to suit your needs. Make a splash and protect your feet in rainy weather in women's size 6 Wellington boots. Whether you are after a pair of wellies to walk your dog in or are heading off to a festival, find your perfect pair from this great range.